Midlands Air Ambulance Charity has recently unveiled three new rapid response vehicles to support the lifesaving organisation’s operations across the region. As the charity covers the largest air ambulance operating area in England, it is imperative the expert aircrew can rely on the very best vehicles to swiftly reach, and subsequently treat those in critical need of pre-hospital care. With assistance from the its corporate partners, M6toll, the charity took delivery of a fleet of three BMW X5 rapid response vehicles (RRVs) to complement air operations. The three Authority specification BMW X5 vehicles are situated at the organisation’s three airbases – RAF Cosford in Shropshire, Tatenhill airfield in Staffordshire, and Strensham Services on the M5 in Worcestershire. Already in action, the new cars are deployed if a helicopter is grounded, for example during the hours of darkness or a period of particularly bad weather. 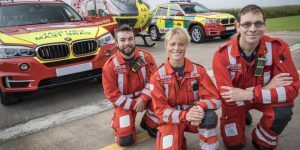 On average five per cent of incidents Midlands Air Ambulance attends are via the RRVs, enabling the aircrew to continue to offer early medical intervention and save lives when the aircraft is not an option. To take full advantage of the space and maximise clinician’s time efficiency at the incident scene, a great deal of research went into the medical fit-out of the BMWs, with the charity’s health partner, West Midlands Ambulance Service. Duplicating the medical kit on the helicopters, the BMWs are ready for action at a moment’s notice. Each RRV carries a range of kit including; two response bags, a Zoll cardiac monitor, suction and ventilation equipment, leg splints, oxygen, burns packs, scene lighting and a safe for storing drugs in transit. The charity’s new RRVs were part-funded by corporate partner, M6toll, and a grant giving organisation, and have been supported by the following; West Midlands Ambulance Service, BMW Group, Carnation Designs, Design, Woodway Engineering, Wilker Vehicle Conversions, VUE CCTV, Mansfield Group, Body Repair Centre and Tarrafix.